A large grey wader that is much more coastal than the Black-tailed Godwit. Apart from its barred tail (which is only obvious in flight) it can be told from its close relative by its stockier build, proportionately shorter bill (which can look slightly upturned) and more coarsely marked plumage. The Bar-tailed Godwits that winter in Britain & Ireland breed in northern Fennoscandia and western Siberia. Some birds pass through The Wash on their way to wintering grounds in west Africa but many more spend the winter here; 10-15% of those caught on The Wash in mid to late August are thought to be from the Siberian breeding population that winters in West Africa. Bar-tailed Godwits are winter and passage visitors to The Wash, with the first birds arriving back in July and leaving for the breeding grounds in April. Most are caught during the autumn passage period in August and September. 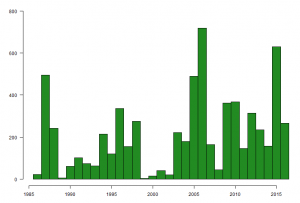 The number of Bar-tailed Godwits caught on The Wash, by month, between 1985 and 2016. Bar-tailed Godwits feed on the muddy shores all around The Wash. They are best seen in the two hours either side of high tide; at low tide they may feed many miles into the estuary. Bar-tailed Godwits probe the mud (even if it is covered in 10-15 cm of water) for molluscs, crustaceans and worms. 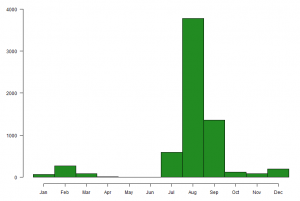 As the graph below shows, the number of Bar-tailed Godwits caught each year varies. 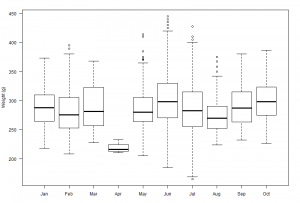 Some annual fluctuations are related to the success of catching attempts rather than being representative of the number of birds present. The number of Bar-tailed Godwits caught on The Wash, by year, between 1985 and 2016. This bird also holds the record for the oldest Bar-tailed Godwit to be ringed in Britain & Ireland. 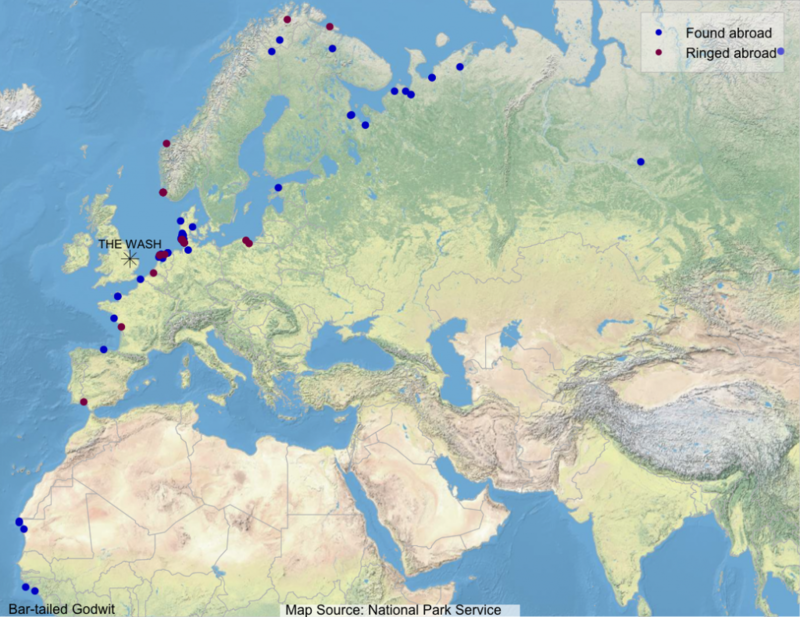 The following map shows where Wash-ringed Bar-tailed Godwits have been found abroad (blue dots) and where foreign-ringed birds that have been encountered on The Wash were ringed (maroon dots). The graph below shows the average weights, by month, of Bar-tailed Godwits caught on The Wash between 1985 and 2016. The thick horizontal line gives the average weight and the box indicates the middle 50% of weights. The thin vertical lines indicate the range of observations, with the circles identifying the most extreme values. The result for April reflects the small sample size of only three birds. The group marks Bar-tailed Godwit with white flags bearing two alphanumeric characters on the left tibia (=upper leg) and a plain scheme marker on the right tibia. Birds caught prior to 2016 have a white scheme marker, birds marked from 2016 onwards have an orange scheme marker. This project started in 2010 and the group has recorded over 500 sightings allowing precise survival estimates to be made, and it is the only project in the UK to provide such information. 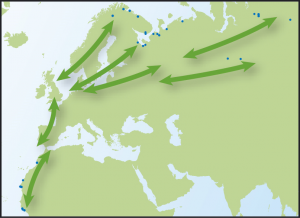 The project also provides information regarding the migratory patterns of Bar-tailed Godwit with regular sightings from the Netherlands and the Baltic countries on the migration routes which help confirm previous metal ring recovery data. Many Bar-tailed Godwits pass through the Wash as they migrate between summer breeding and wintering areas. Observations of WWRG colour-flagged Godwits in northern Norway and the Canary Islands highlight the wide range of locations occupied by ‘our’ birds at different times of year.